Did you know that what God has always wanted is for you to become one of His friends? 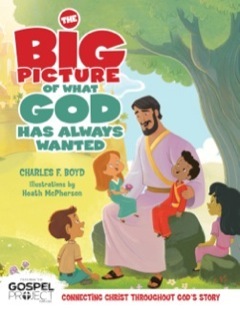 More than a children’s book, The Big Picture of What God Has Always Wanted is for parents who care deeply about passing on a legacy of faith in Christ to the next generation – parents who invite children to “ask Jesus into your heart.” But what does that phrase really mean? And is it biblical? Author Charles F. Boyd has found that when asked, many children don't understand that this phrase is symbolic. Seeing this disconnect between a grown-up's metaphor and a child's understanding, he writes here to help children understand the simple Gospel message: God desires to live in friendship with the people He created, now and forever. Boyd also shares the big-picture story of the Bible, from Genesis through Revelation. Charles Boyd is the teaching pastor at Southside Fellowship church in Greenville, South Carolina, and the author of Different Children, Different Needs which has sold more than 100,000 copies and has been translated into several languages. He and his wife, Karen, have three children.